Ulysses S. Grant (born Hiram Ulysses Grant; April 27, 1822 – July 23, 1885) was the 18th President of the United States (1869–1877). In 1865, as commanding general, Grant led the Union Armies to victory over the Confederacy in the American Civil War. He then implemented Congressional Reconstruction, often at odds with President Andrew Johnson. Twice elected president, Grant led the Radical Republicans in their effort to remove the vestiges of Confederate nationalism and slavery, protect African-American citizenship, and defeat the Ku Klux Klan. 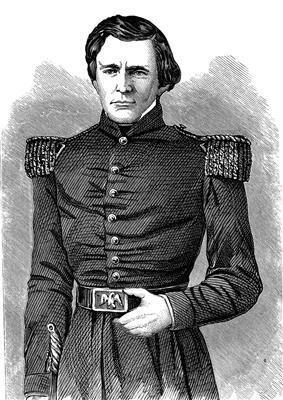 Grant graduated in 1843 from the United States Military Academy at West Point and served in the Mexican–American War. When the Civil War began in 1861, he rejoined the U.S. Army. In 1862, Grant took control of Kentucky and most of Tennessee, and led Union forces to victory in the Battle of Shiloh, earning a reputation as an aggressive commander. He incorporated displaced African American slaves into the Union war effort. In July 1863, after a series of coordinated battles, Grant defeated Confederate armies and seized Vicksburg, giving the Union control of the Mississippi River and dividing the Confederacy in two. After his victory in the Chattanooga Campaign, President Abraham Lincoln promoted him to lieutenant general and commander of all the Union Armies. Grant confronted Robert E. Lee in a series of bloody battles in 1864, trapping Lee's army at Petersburg, Virginia. During the siege, Grant coordinated a series of devastating campaigns in other theaters. The war ended shortly after Lee's surrender at Appomattox. Historians have hailed Grant's military genius, and his strategies are featured in the military history textbooks, but a minority contend that he won by brute force rather than superior strategy. After the Civil War, Grant led the Army's supervision of Battle of the Little Big Horn. Throughout his presidency, Grant faced Congressional investigations into federal corruption, including bribery charges against two of his Cabinet members. Grant's economic policy resulted in deflation and implementation of a gold standard. His second term saw the Panic of 1873, the discovery of gold in the Black Hills, and the Great Sioux War, while conservative white Southerners regained control of Southern state governments and Democrats took control of the federal House of Representatives. In foreign policy, Grant sought to increase American trade and influence, while remaining at peace with the world; his administration successully resolved the Alabama Claims with Great Britain ending bitter wartime tensions. Grant avoided war with Spain over the Virginius Affair, but his attempted annexation of the Dominican Republic was rejected by Congress. His response to the Panic of 1873 gave some financial relief to New York banking houses, but was ineffective in halting the five-year economic depression that produced high unemployment, low prices, low profits and high rates of bankruptcy. Leaving office in 1877, Grant embarked on a widely praised round trip world tour lasting over two years. In 1880 Grant was unsuccessful at obtaining a third term Republican nomination. Financially destitute, Grant completed his critical and popular successful memoirs, while dying of throat cancer. Grant's death in 1885 prompted an outpouring of national unity and mourning. Few presidential reputations have fluctuated as dramatically as Grant's. The late 19th century saw a high opinion of his presidency, which shifted to a low opinion among historians for much of the 20th century, before recovering beginning in the 1980s. His critics note the misadventure of his failed Dominican Republic annexation, his economic mismanagement of the nation after the Panic of 1873, and corruption issues under his administration, while admirers emphasize his commitment to civil rights, prosecution of the Ku Klux Klan, enforcement of voting rights, and personal integrity. Hiram Ulysses Grant was born in Brown County, Ohio. Unlike his younger siblings, Grant was neither baptized nor forced to attend church by his Methodist parents; for the rest of his life, he prayed privately and never officially joined any denomination. In his youth, Grant developed an unusual ability to work with and control horses and became known as a capable horseman. At 17, Congressman Thomas L. Hamer nominated Grant for admission to the United States Military Academy at West Point, New York. Hamer mistakenly wrote down the name as "Ulysses S. Grant of Ohio", and this became his adopted name. (According to Grant, the S. did not stand for anything, though Hamer had used it to abbreviate his mother's maiden name.) His nickname became "Sam" among army colleagues at the academy since the initials "U.S." also stood for "Uncle Sam". He stood 5 feet 1 inch (1.55 m) and weighed 117 pounds (53 kg) when he entered West Point. Grant later recalled "a military life had no charms for me" and that he had been lax in his studies, but he achieved above-average grades in mathematics and geology. Although he had a quiet nature, he established a few intimate friends at West Point, including Frederick Tracy Dent and Rufus Ingalls. Grant studied under Romantic artist Robert Walter Weir and produced nine surviving artworks. He also established a reputation as a fearless and expert horseman, setting an equestrian high-jump record that stood for almost 25 years. He graduated in 1843, ranking 21st in a class of 39. Grant was glad to leave the Academy and planned to resign his commission after serving the minimum four-year term of duty. Despite his excellent horsemanship, he was not assigned to the cavalry (assignments were determined by class rank, not aptitude), but to the 4th Infantry Regiment. He was made regimental quartermaster, managing supplies and equipment, with the rank of brevet second lieutenant. Grant's first assignment after graduation took him to the Jefferson Barracks near St. Louis, Missouri, in September 1843. It was the nation's largest military base in the west, commanded by Colonel Stephen W. Kearny. Grant was happy with his new commander, but looked forward to the end of his military service and a possible teaching career. He spent some of his time in Missouri visiting the family of his West Point classmate, Frederick Dent; he became engaged to Dent's sister, Julia, in 1844. Amid rising tensions with Mexico, Grant's unit shifted to Louisiana as part of the Army of Observation under Major General Zachary Taylor. When the Mexican–American War broke out in 1846, the Army entered Mexico. Although a quartermaster, and not in charge of any company, Grant participated in leading a cavalry charge at the Battle of Resaca de la Palma. At Monterrey, he demonstrated his equestrian ability, carrying a dispatch through sniper-lined streets while mounted in one stirrup. President James K. Polk, wary of Taylor's growing popularity, divided his army, sending some troops (including Grant's unit) to form a new army under Major General Winfield Scott. Scott's army landed at Veracruz and advanced toward Mexico City. The army met the Mexican forces at the battles of Molino del Rey and Chapultepec outside Mexico City. At Chapultepec, Grant dragged a howitzer into a church steeple to bombard nearby Mexican troops. Scott's army entered the city, and the Mexicans agreed to peace soon afterward. In his Memoirs, Grant wrote that he had learned about military leadership by observing the decisions and actions of his commanding officers, and in retrospect he identified his leadership style with Taylor's. At the time, he believed that the war was a wrongful one and that the territorial gains from the war were designed to expand slavery. Reflecting on the Mexican-American War, Grant wrote in 1883, "I was bitterly opposed to the measure, and to this day, regard the war, which resulted, as one of the most unjust ever waged by a stronger against a weaker nation." He also opined that the Civil War was punishment inflicted on the nation for its aggression in Mexico. Grant chose to remain in the U.S. military after his mandatory service had expired in 1847. Four years after becoming engaged, he married Julia on August 22, 1848. They had four children: Frederick, Ulysses Jr., Ellen, and Jesse. Grant received assignments to several posts over the ensuing six years. His first post-war assignments took him and Julia to Detroit and then to Sackets Harbor, New York, the place where they were happiest. In the spring of 1852, he traveled to Washington, D.C., in a failed attempt to persuade Congress to absolve him of a $1,000 debt to the Army for goods gone astray while in his custody. That same year, his next assignment as quartermaster sent him west to Fort Vancouver in the Oregon Territory, initially landing him in San Francisco during the height of the California Gold Rush. Julia could not go with him as she was eight months pregnant with Ulysses Jr. An outbreak of cholera while traveling overland through Panama caused 150 fatalities among the entourage. Grant arranged makeshift transportation and hospital facilities to care for the sick. Grant's time in the Pacific Northwest followed the Cayuse War; the army was stationed there to keep peace between settlers and Indians. To supplement a military salary inadequate to support his family, Grant attempted but failed at several business ventures. The failures confirmed Jesse Grant's belief that his son had no head for business, frustrating both father and son. In one case, Grant naïvely trusted a business partner who swindled him out of money. He grew unhappy separated from his family, and rumors circulated that he was drinking to excess. "Ulysses S. Grant: A Resource Guide". Web Guides. Library of Congress. Retrieved March 25, 2014. "About Ulysses S. Grant". Ulysses S. Grant Presidential Library. Ulysses S. Grant Presidential Assoc. and Mississippi State University Libraries. Retrieved March 25, 2014. "Ulysses S. Grant". American Presidents: Life Portraits. C-SPAN. Retrieved March 25, 2014. 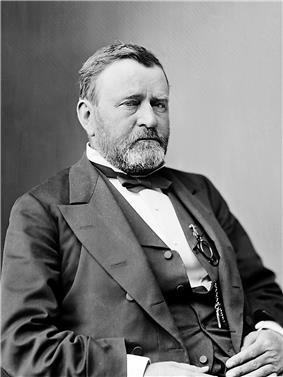 "Ulysses S. Grant (1822–1885)". American President: A Reference Resource. Miller Center, University of Virginia. Retrieved March 25, 2014. Ackerman, Kenneth D. (2011). The Gold Ring Jim Fisk, Jay Gould, and Black Friday, 1869. Brands, H. W. (December 2012). "Presidents in Crisis Grant: Takes on the Klan". American History: 42–47. Kohn, George C. (2000). The New Encyclopedia of American Scandal. Kreiser, Christine (2013). "Royal Visit". American History 47 (6): 19. Longacre, Edward G. (2006). General Ulysses S. Grant The Soldier And The Man. Cambridge, Massachusetts: First De Capo Press. McFeely, William S. (1974). Woodward, C. Vann, ed. Responses of the Presidents to Charges of Misconduct. New York, New York: Delacorte Press. pp. 133–162. Patrick, Rembert W. (1968). The Reconstruction of the Nation. Paxson, Frederic Logan; Bach, Christian A. (1931). "Ulysses S. Grant". Rable, George C. (2007). But There Was No Peace: The Role of Violence in the Politics of Reconstruction. Athens, Georgia: University of Georgia Press. Renehan, A; Lowry, J C (July 1995). "The oral tumours of two American presidents: what if they were alive today?". J R Soc Med. 88 (7): 377–383. Venable, Shannon (2011). Gold: A Cultural Encyclopedia. ABC-CLIO. Waltmann, Henry G. (Winter 1971). "Circumstantial Reformer: President Grant & the Indian Problem". Arizona and the West 13 (4): 323–342. Waugh, Joan (2009). U.S. Grant: American Hero, American Myth. The University of North Carolina Press. Weinstein, Allen (1967). "Was There a 'Crime of 1873'? : The Case of the Demonetized Dollar". Journal of American History 54 (2): 307–326. Bonekemper III, Edward H. (2004). A Victor, Not a Butcher: Ulysses S. Grant's Overlooked Military Genius. Donovan, James (2008). A Terrible Glory Custer and the Little Bighorn --- The Last Great Battle of the American West. Farina, William (2007). Ulysses S. Grant, 1861–1864: His Rise from Obscurity to Military Greatness. Jefferson, North Carolina: McFarland & Co. Flood, Charles Bracelen (2005). Grant and Sherman The Friendship That Won The Civil War. New York, New York: Harper Perennial. Friedman, Norman (1985). U.S. Battleships: An Illustrated Design History. Gott, Kendall D. (2003). Where the South Lost the War: An Analysis of the Fort Henry—Fort Donelson Campaign, February 1862. Mechanicsburg, PA: Stackpole Books. Hubbell, John T. (1980). "Abraham Lincoln and the Recruitment of Black Soldiers". Journal of the Abraham Lincoln Association 2 (1): 6–21. Lewis, Lloyd (1950). Captain Sam Grant. Boston: Little, Brown. Newell, Clayton R.; Shrader, Charles R. (2011). Of Duty Well and Faithfully Done: A History of the Regular Army in the Civil War. University of Nebraska: Board of Regents of the University of Nebraska. Simon, John Y. (1967–2009). "The Papers of Ulysses S. Grant" 1–31. Mississippi State University Online Edition. Bonekemper III, Edward H. (April 2011). "The butcher's bill: Ulysses S. Grant is often referred to as a 'butcher,' but does Robert E. Lee actually deserve that title?". Civil War Times 52 (1): 36–43. Rafuse, Ethan S. (July 2007). "Still a Mystery? General Grant and the Historians, 1981–2006". Journal of Military History 71 (3): 849–74. Russell, Henry M. W. (Spring 1990). "The memoirs of Ulysses S. Grant: The rhetoric of judgment". Virginia Quarterly Review 66 (2): 189–209. Simpson, Brooks D. (2000). "Continuous Hammering and Mere Attrition: Lost Cause Critics and the Military Reputation of Ulysses S. Grant". In Gallagher, Gary W.; Nolan, Alan T. The Myth of the Lost Cause and Civil War History. Bloomington, Indiana: Indiana University Press. Wilson, Edmund (1962). Patriotic Gore: Studies in the Literature of the American Civil War. ^ Bonekemper 2004, pp. 271–282. ^ a b c Foner 2012. ^ a b Brands 2012b, p. 44. ^ Farina, pp. 13–14; Simpson 2000, pp. 2–3; Longacre, pp. 6–7. ^ McFeely 1981, pp. 8, 10. ^ McFeely 1981, p. 12; Smith, pp. 24, 83. ^ McFeely 1981, p. 13. ^ McFeely 1981, p. 20; Longacre, p. 18. ^ McFeely 1981, pp. 16, 19. ^ Smith, pp. 26–28; Longacre, p. 24. ^ a b Smith, pp. 30–33. ^ McFeely 1981, pp. 32–33. ^ Longacre, pp. 37–42; Brands 2012a, pp. 34–38. ^ McFeely 1981, pp. 34–35. ^ McFeely 1981, pp. 36–37. ^ McFeely 1981, pp. 31, 37. ^ McFeely 1981, pp. 20, 26. ^ McFeely 1981, p. 44. ^ McFeely 1981, p. 46. ^ McFeely 1981, p. 47. ^ a b McFeely 1981, pp. 48–49. ^ a b Flood, p. 43. ^ McFeely 1981, p. 55. ^ Smith, pp. 87–88; Lewis, pp. 328–332. ^ McFeely 1981, p. 57. ^ a b c d McFeely 1981, pp. 58–60. ^ a b Smith, pp. 94–95. ^ McFeely 1981, p. 64. ^ McFeely 1981, pp. 65–66; Farina, p. 11. ^ a b McFeely 1981, p. 69. ^ Brands 2012a, p. 95. ^ Catton 1968, p. 8. ^ Brands 2012a, p. 123. ^ McFeely 1981, p. 80. ^ Smith, pp. 117–118; Catton 1963, p. 29. ^ a b Brands 2012a, p. 121. ^ McFeely 1981, pp. 73–76, 80; Smith, pp. 107–108; Brands 2012a, p. 121. ^ McFeely 1981, p. 73. ^ Brands 2012a; Flood, p. 71. ^ McFeely 1981, pp. 92–94. ^ Gott, pp. 97–98; Smith, pp. 141–164. ^ Smith, pp. 139, 147. ^ Smith, pp. 141–164; Brands 2012a, pp. 164–165. ^ Brands 2012a, pp. 164–165; Smith, pp. 125–134. ^ a b McFeely 1981, p. 111. ^ Flood, pp. 109, 111. ^ McFeely 1981, p. 114; Flood, pp. 109, 112. ^ Brands 2012a, pp. 186–188. ^ Brands 2012a, pp. 190–192. ^ Brands 2012a, pp. 211-212. ^ Brands 2012a, pp. 221-222. ^ Brands 2012a, pp. 222, 223. ^ Brands 2012a, p. 217. ^ Smith, pp. 225–227; Flood, p. 143. ^ McFeely 1981, p. 124. ^ a b Flood, pp. 147-148. ^ Brands 2012a, pp. 223, 225. ^ McFeely 1981, pp. 125–126. ^ Brands 2012a, pp. 226-227. ^ Brands 2012a, pp. 227-228. ^ McFeely 1981, pp. 132–135. ^ McFeely 1981, pp. 122–138; Smith, pp. 206–257. ^ McFeely 1981, pp. 128, 135. ^ McFeely 1981, p. 136. ^ Catton 1968, p. 7. ^ Newell-Shrader, p. 28; Brands 2012a, p. 265. ^ Brands 2012a, p. 267; McFeely 1981, p. 145. ^ Brands 2012a, pp. 267-268. ^ McFeely 1981, p. 147; Smith, pp. 267–268; Catton 1968, pp. 46, 54. ^ Flood, p. 232; McFeely 1981, p. 148. ^ McFeely 1981, p. 156. ^ McFeely 1981, p. 157. ^ McFeely 1981, pp. 157–175; Smith, pp. 313–339, 343–368. ^ McFeely 1981, pp. 162–163. ^ McFeely 1981, p. 165. ^ McFeely 1981, p. 169. ^ Bonekemper 2011, pp. 41–42. ^ McFeely 1981, pp. 157–175; Smith, pp. 313–39, 343–68. ^ McFeely 1981, pp. 178–186. ^ McFeely 1981, p. 179; Smith, pp. 369–395; Catton 1968, pp. 308–309. ^ Catton 1968, p. 349. ^ Catton 1968, p. 309. ^ Catton 1968, p. 294. ^ McFeely 1981, pp. 198–210. ^ McFeely 1981, pp. 212, 219–220. ^ McFeely 1981, p. 224. ^ Brands 2012a, pp. 375–376. ^ McFeely 1981, p. 225. ^ a b McFeely 1981, p. 227–229. ^ Brands 2012a, pp. 410–411. ^ McFeely 1981, pp. 232–233. ^ McFeely 1981, p. 234. ^ Brands 2012a, p. 390; Smith, p. 420; McFeely 1981, pp. 238–241. ^ Brands 2012a, p. 390. ^ McFeely 1981, pp. 238, 240. ^ McFeely 1981, p. 240; Smith, p. 420. ^ McFeely 1981, pp. 240–241. ^ Brands 2012a, pp. 392, 396. ^ Brands 2012a, p. 396. ^ Smith, pp. 369–397; Brands 2012a, p. 389. ^ a b c Brands 2012a, pp. 397–398. ^ Brands 2012a, pp. 398–399. ^ McFeely 1981, pp. 259–261. ^ Smith, pp. 421, 433. ^ McFeely 1981, pp. 262–264. ^ a b c Smith, pp. 448–451. ^ McFeely 1981, p. 275. ^ McFeely 1981, pp. 264–267. 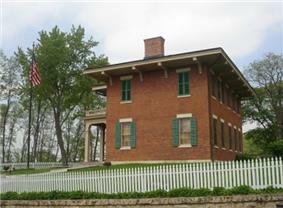 ^ Grant Home, Galena State Historic Sites. Retrieved February 9, 2007. 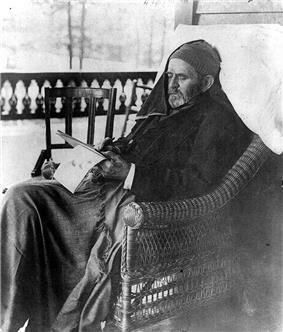 ^ Ulysses S. Grant Home, NHL Database, National Historic Landmarks Program. Retrieved February 9, 2007. ^ McFeely 1981, pp. 282–284. ^ McFeely 1981, pp. 278, 283. ^ McFeely 1981, p. 284. ^ McFeely 1981, p. 286; Smith, pp. 465–466. ^ Simon 2002, p. 247. ^ Simon 2002, pp. 246–247. ^ Brands 2012a, p. 512. ^ a b Brands 2012a, p. 435. ^ a b c Brands 2012a, p. 465. ^ Brands 2012a, pp. 538–539. ^ Brands 2012a, pp. 540–541. ^ McFeely 1981, pp. 420–422. ^ Brands 2012a, p. 553. ^ McFeely 1981, pp. 418–419. ^ a b McFeely 1981, pp. 308–309; Brands 2012a, p. 502. ^ Smith, pp. 536–538; Brands 2012a, pp. 501–503. ^ Brands 2012a, p. 501. ^ Brands 2012a, pp. 501–503; McFeely 1981, pp. 436–437. ^ a b Donovan, pp. 115, 322–323. ^ Brands 2012a, pp. 565–566. ^ McFeely 1981, pp. 336–338; Brands 2012a, p. 452. ^ McFeely 1981, pp. 336–338. ^ a b c Smith, pp. 500–502. ^ Brands 2012a, pp. 455–456. ^ a b McFeely 1981, pp. 339–341. ^ McFeely 1981, pp. 349–352. ^ Brands 2012a, pp. 454. ^ McFeely 1981, pp. 334–336. ^ Simon 2002, p. 249. ^ McFeely 1981, pp. 352–354. ^ a b Kreiser, p. 19. ^ McFeely 1981, p. 279. ^ Smith, pp. 480–481; Ackerman, pp. 90–91. ^ Brands 2012a, pp. 437–439. ^ McFeely 1981, pp. 323–324. ^ Brands 2012a, p. 437-443. ^ Brands 2012a, pp. 445, 636. ^ McFeely 1981, p. 328. ^ a b Brands 2012a, pp. 508–509. ^ a b Simon 2002, p. 250. ^ Smith, pp. 589–590; Patrick, p. 173. ^ a b Brands 2012a, pp. 488–489. ^ Brands 2012a, p. 494. ^ McFeely 1981, p. 381. ^ Brands 2012a, p. 495. ^ McFeely 1981, p. 384. ^ a b Brands 2012a, p. 499. ^ a b Brands 2012a, p. 517. ^ McFeely 1981, p. 393. ^ a b Smith, pp. 576–579. ^ Brands 2012a, p. 518. ^ McFeely 1981, p. 391; Smith, pp. 375–377. ^ McFeely 1981, p. 395. ^ a b c d Smith, pp. 580–581. ^ a b McFeely 1974, pp. 133–134. ^ a b Smith, p. 587. ^ McFeely 1974, p. 133; Woodward, pp. 53–108. ^ McFeely 1974, pp. 134, 144. ^ a b Smith, p. 578. ^ McFeely 1974, pp. 147–148. ^ Brands 2012a, pp. 556–557; Kohn, p. 417. ^ Brands 2012a, pp. 556–557. ^ a b c d e Kohn, p. 417. ^ a b Smith, pp. 591–593. ^ McFeely 1981, p. 415; Smith, p. 591. ^ Brands 2012a, p. 560; Donovan, p. 104. ^ a b McFeely 1981, pp. 435–436. ^ McFeely 1974, p. 153. ^ Smith, pp. 587–590; Simon 2002, p. 250. ^ Simon 2002, p. 250; Patrick, p. 172. ^ Smith, pp. 584–585; Hesseltine, p. 366. ^ a b c Smith, pp. 506–507. ^ McFeely 1981, p. 387. ^ a b Smith, pp. 507–508. ^ a b c d e Smith, pp. 558–563. ^ a b c McFeely 1981, pp. 387–389. ^ McFeely 1981, pp. 392–393. ^ McFeely 1981, pp. 440–441; Patrick, p. 255. ^ McFeely 1981, pp. 440–441. ^ Smith, p. 601; Patrick, p. 267. ^ McFeely 1981, pp. 448–449. ^ McFeely 1981, pp. 454–455. ^ Brands 2012a, pp. 581–583. ^ McFeely 1981, pp. 460–465. ^ McFeely 1981, pp. 466–467. ^ Brands 2012a, pp. 585–586. ^ a b McFeely 1981, pp. 471–473. ^ Brands 2012a, pp. 590–591. ^ Brands 2012a, pp. 591–592. ^ Brands 2012a, pp. 593–594. ^ McFeely 1981, p. 477. ^ a b Smith, pp. 614–615. ^ a b c Brands 2012a, pp. 600–601. ^ McFeely 1981, pp. 479–481. ^ Brands 2012a, p. 602. ^ Brands 2012a, pp. 604–605. ^ Brands 2012a, pp. 607–609. ^ Brands 2012a, p. 611. ^ a b c d McFeely 1981, pp. 486–489. ^ a b McFeely 1981, pp. 488–491. ^ Brands 2012a, p. 619. ^ a b Brands 2012a, pp. 620–621. ^ McFeely 1981, pp. 492–493. ^ Brands 2012a, pp. 622–626. ^ Renehan & Lowry, pp. 377–383. ^ McFeely 1981, p. 494. ^ a b McFeely 1981, pp. 501–505. ^ Brands 2012a, pp. 629–630. ^ McFeely 1981, p. 517. ^ a b c d Brands 2012a, pp. 633–635. ^ a b Waugh, p. 2. ^ McFeely 1981, p. 521. ^ Paxson & Bach, p. 500. ^ McFeely 1981, p. 522. ^ Simon 1982, p. 221. ^ a b Simon 2002, p. 253. ^ Simon 1982, p. 220. ^ Brands 2012a, p. 636. ^ Badeau 1887, p. 250. ^ a b Brands 2012b, p. 45. ^ "General Ulysses S. Grant Memorial, (sculpture)". CollectionsSearchCenter. Smithsonian Institution. 2014. 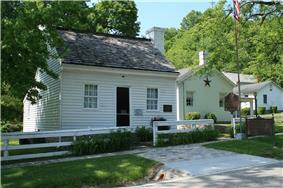 ^ "Ulysses S. Grant National Historic Site". National Park Service. 2014. ^ National Park Service (2007). "Sequoia and Kings Canyon National Parks Information Page". ^ According to biographer McFeely, historians overwhelmingly agree that his drunkenness, although off duty, at the time was a fact, though there are no eyewitness reports extant. ^ Residents of Galena gave Grant the home in 1865 as thanks for his war service. After his presidential term ended in 1877, Grant visited the home occasionally. Maintenance of the home as a memorial to Grant started in 1904 and continues today. ^ The international tribunal awarded the United States $15,500,000. ^ Greeley died after election day but before the day the Electoral College voted, as a result, Greeley's Democratic opponents received his electoral votes. ^ McFeely, writing in 1981, believed that Grant knew of Babcock's guilt, while Smith, in 2001, believed the evidence against Babcock was circumstantial at best. 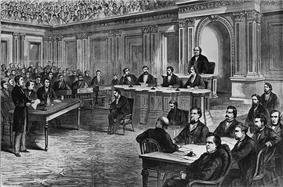 ^ Congress had changed the law in 1866 to remove one seat on the Court each time a justice retired, to prevent Andrew Johnson from nominating replacements for them. When Grant took office, there were eight seats on the bench. ^ Today, medical historians believed he suffered from a T1N1 carcinoma of the tonsillar fossa. In May 2012, the Ulysses S. Grant Foundation, on the institute's fiftieth anniversary, selected Mississippi State University as the permanent location for Ulysses S. Grant's Presidential Library. Historian John Y. Simon edited Grant's letters into a 32-volume scholarly edition published by Southern Illinois University Press. Several memorials honor Grant. In addition to his mausoleum, the General Grant National Memorial in New York, there is the Ulysses S. Grant Memorial at the foot of Capitol Hill on the mall in Washington, D.C. There is the Ulysses S. Grant National Historic Site near St. Louis and several other sites in Ohio and Illinois associated with his life that are kept in his honor. There are smaller memorials in Chicago's Lincoln Park and Philadelphia's Fairmount Park. Named in his honor are Grant Park as well as a number of counties in western and midwestern states. From 1890 to 1940, the Department of Interior and the National Park Service called part of what is now Kings Canyon National Park, General Grant National Park, named for the General Grant sequoia. Grant has appeared on the front of the United States fifty-dollar bill since 1913, and appears on several stamps. 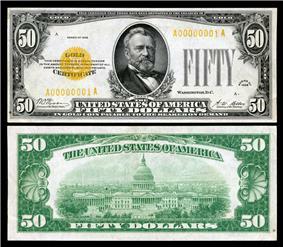 Grant has appeared on the United States fifty-dollar bill since 1913. Grant's reputation, for the most part, remained popular throughout the nation from the end of the Civil War until his death. In 1876, Grant's popularity declined due to Congressional investigations into federal departmental corruption, Belknap's Senate trial, and the defeat of Colonel Custer at the Battle of the Little Big Horn. In 1877, both Democrats and Republicans admired Grant's peaceful handling of the 1876 presidential election crisis that divided the nation. Grant's personal reputation rebounded after leaving office during his popular and well publicized World Tour. In 1884, Grant's personal reputation was under suspicion after the collapse of Grant & Ward, however, this was offset by the immense popularity of his 1885 highly acclaimed Memoirs. Grant's popularity continued to increase in the years after his death, and his tomb became a major pilgrimage destination during the end of the 19th century. With the increasing popularity of the Lost Cause myth and its tendency to romanticize the confederacy early in the 20th century, a more negative view became increasingly common. As his critics had early in the Civil War, his new critics returned to many of the same attacks, that he was a drunk, was reckless, and in light of his presidency, that he was also corrupt. His reputation reached new lows in light of this new viewpoint: he was seen as an unsuccessful president and an unskilled, if lucky, general. As such, by the mid-20th century historians generally ranked his presidency poorly, and minimized his role in winning the Civil War. When this romanticized view of the confederacy faded and was replaced by overt hostility, his reputation too began to recover. Today his military reputation has largely recovered, while views on his presidency continue to recover. Few presidents' reputations have changed as dramatically as Grant's. Millions of people turned out for his funeral procession in 1885 and attended the 1897 dedication of his tomb demonstrating that at his death, Grant was popularly seen as "a symbol of the American national identity and memory." At the same time, however, commentators and scholars portrayed his as the most corrupt administration in American history. In the 1930s, biographer William B. Hesseltine noted that Grant's reputation deteriorated because his enemies were better writers than his friends. In 1931, Frederic Paxson and Christian Bach in the Dictionary of American Biography praised Grant's military vision and his execution of that vision in defeating the Confederacy, but of his political career, the authors were less complimentary. Speaking specifically of the scandals, they wrote that "personal scandal has not touched Grant in any plausible form, but it struck so close to him and so frequently as to necessitate the vindication of his honor by admitting his bad taste in the choice of associates." William S. McFeely won the Pulitzer Prize for his critical 1981 biography that also focused on the failure of Grant's presidency to carry out lasting progress and concluded, "[h]e did not rise above limited talents or inspire others to do so in ways that make his administration a credit to American politics." John Y. Simon in 1982 responded to McFeely: "Grant's failure as President ... lies in the failure of the Indian peace policy and the collapse of Reconstruction ... But if Grant tried and failed, who could have succeeded?" Simon praised Grant's first term in office arguing that it should be, "remembered for his staunch enforcement of the rights of freedmen combined with conciliation of former Confederates, for reform in Indian policy and civil service, for successful negotiation of the Alabama Claims, and for delivery of peace and prosperity." According to Simon, the Liberal Republican revolt, the Panic of 1873, and the North's conservative retreat from Reconstruction weakened Grant's second term in office, although his foreign policy remained steady. 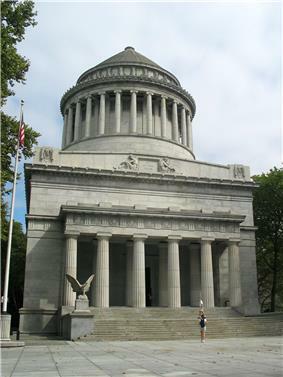 General Grant National Memorial, known colloquially as "Grant's Tomb", is the largest mausoleum in North America, and one of the largest in the world. Grant died on July 23, 1885, at the age of 63. Sheridan, then Commanding General of the Army, ordered a day-long tribute to Grant on all military posts, and President Abraham Lincoln. Grant took up the project and asked his former staff officer, Adam Badeau, to help edit his work. Grant's son Fred assisted with references and proofreading. Century offered Grant a book contract with a 10% royalty, but Grant's friend, Mark Twain, made his own offer to Grant for his memoirs, proposing a 75% royalty. Grant ultimately decided on Twain's publishing company, Charles L. Webster and Company. Grant worked diligently on the memoir at his home in New York City, and then from a cottage on the slopes of Mount McGregor, finishing shortly before he died on July 23, 1885. The book, entitled Personal Memoirs of Ulysses S. Grant, was a success. In the end, Julia Grant received about $450,000, suggesting a royalty of about 30%. The memoir has been highly regarded by the public, military historians, and literary critics. Grant was a shrewd and effective writer, portraying himself in the persona of the honorable Western hero, whose strength lies in his honesty and straightforwardness. He candidly depicted his battles against both the Confederates and internal Army foes. Twain called the Memoirs a "literary masterpiece." In reviewing the favorable literary critique of Grant's book, including the analyses of Matthew Arnold and Edmund Wilson, author Mark Perry called the Memoirs "the most significant work" of American non-fiction. Grant had forfeited his military pension when he assumed the presidency, but Congress restored him to the rank of General of the Army with full retirement pay in March 1885. Around the same time, Grant learned that he was suffering from throat cancer. To restore his family's income, Grant wrote several articles on his Civil War campaigns for The Century Magazine at $500 each. The articles were well received by critics, and the editor, Robert Underwood Johnson, suggested Grant write a book of memoirs, as Sherman and others had done. At the same time, Grant's son Ulysses Jr. ("Buck") had opened a Wall Street brokerage house with Ferdinand Ward. Regarded as a rising star, Ward, and the firm, Grant & Ward, were initially successful. In 1883, Grant joined the firm and invested $100,000 of his own money. Success attracted more investors, who bought securities through the firm, whereupon Ward used the securities as collateral to borrow money to buy more securities. Grant & Ward pledged that collateral to borrow more money to trade in securities on the firm's own account. The practice—called hypothecation—was legal and accepted; what was illegal was rehypothecation, the practice of pledging the same securities as collateral for multiple loans. Ward, having colluded with the bank involved, did this for many of the firm's assets. If the trades resulted in profit, then there would be no problem; if the trades went bad, however, multiple loans would come due, all backed up by the same collateral. Historians acknowledge that Grant was likely unaware of Ward's tactics, but it is unclear how much Buck Grant knew. In May 1884, enough investments went bad to convince Ward that the firm would soon be bankrupt. Ward told Grant of the impending failure, but suggested that this was a temporary shortfall. Grant approached businessman William Henry Vanderbilt, who gave Grant a personal loan of $150,000. Grant invested the money in the firm, but that was not near enough to save the firm from failure. Essentially penniless, but compelled by a sense of personal honor, Grant repaid what he could with his Civil War mementos and sale or transfer of all other assets. Although the market values did not cover the loan, Vanderbilt insisted the debt was paid in full. Grant was left financially destitute. Grant's world tour, although successful, was costly. When he returned to America, Grant had depleted most of his savings and needed to earn money and find a new home. Anthony Joseph Drexel, wealthy friends of Grant, bought him a home on Manhattan's Upper East Side. To make an income, Grant, Jay Gould, and former Mexican Finance Secretary Matías Romero chartered the Mexican Southern Railroad, which planned to build a railroad from Oaxaca to Mexico City. At the same time, Grant used his influence to convince Chester A. Arthur, who had succeeded Garfield as president in 1881, to negotiate a free trade treaty with Mexico. Arthur and the Mexican government agreed, but the United States Senate rejected the treaty in 1883. The railroad was similarly unsuccessful, falling into bankruptcy the following year. Grant gave speeches for Garfield, but declined to criticize the Democratic nominee, Winfield Scott Hancock, a general who had served under Grant in the Army of the Potomac. Garfield managed to win the popular vote by a narrow margin, however, he solidly won the Electoral College-214 to 155. After the election, Grant gave Garfield his public support, and pushed him to include Stalwarts in his administration. The Stalwarts, led by Grant's old political ally, the convention convened in Chicago in June, there were more delegates pledged to Grant than to any other candidate, but he was still short of a majority vote to capture the nomination. 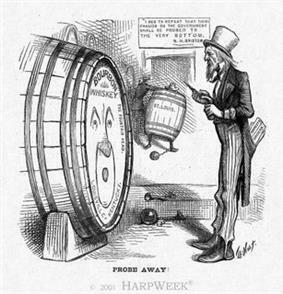 Puck, a Democratic magazine, in 1880 lampooned Grant's support of "rings" of corruption among his associates. By then the Grants had been gone two years, and were homesick. They crossed the Pacific and landed in San Francisco in September 1879, greeted by cheering crowds. After a visit to Yellowstone National Park, they returned at last to Philadelphia on December 16, 1879. The voyage around the world had captured popular imagination, and Republicans—especially those of the Stalwart faction excluded from the Hayes administration—saw Grant in a new light. The Republican nomination for 1880 was wide open after Hayes, the incumbent President, had forsworn a second term and many Republicans thought that Grant was the man for the job. After another visit to England and then to Ireland, the Grants left Europe by ship, sailing through the Suez Canal to India. They visited Bombay, Lucknow, Varanasi, and Delhi, being welcomed in each city by the colonial officials. After India, they toured Burma, Siam (where Grant met King Chulalongkorn,) Singapore, and Vietnam. Traveling on to Hong Kong, Grant began to change his mind on the nature of colonization, believing that the British rule was not "purely selfish" but also good for the colonial subjects. Leaving Hong Kong, the Grants entered China proper, seeing the cities of Canton, Shanghai, and Peking. He declined to ask for an interview with the Guangxu Emperor, a child of seven, but did speak with the head of government, Prince Gong, and Li Hongzhang, a leading general. They discussed China's dispute with Japan over the Ryukyu Islands, and Grant agreed to help bring the two sides to agreement. After crossing over to Japan and meeting the Emperor Meiji, Grant convinced China to accept the Japanese annexation of the islands, and the two nations avoided war. After leaving the White House, Grant and his family stayed with friends in New York, Ohio, and Philadelphia for two months, before setting out on a tour of the world. The trip, which would last two years, began in Liverpool in May 1877, where enormous crowds greeted the ex-president and his entourage. Travelling to London, the Grants dined with Queen Victoria at Windsor Castle, and Grant gave several speeches in the city. They next traveled to Belgium, Germany, and Switzerland, before returning to England. The Grants spent a few months with their daughter Nellie, who had married an Englishman and moved to that country several years before. Returning to the continent, Grant and his wife journeyed on to France and Italy, spending Christmas 1877 aboard USS Vandalia, a warship docked in Palermo. After a winter sojourn in the Holy Land, they visited Greece before returning to Italy and a meeting with Pope Leo XIII. Travelling to Spain and then to Germany again, Grant met with Chancellor Otto von Bismarck, and the two men discussed military matters. Even as Grant drew cheers at the Centennial Exposition in 1876, the collected scandals of the last eight years, the country's weak economy, and the Democratic gains in the House led many in the Republican party to repudiate him. Bristow was among the leading candidates to replace him, suggesting that a large faction desired an end to "Grantism" and feared that Grant would run for a third term. Ultimately, Grant did not run, but neither was Bristow the nominee, as the convention settled on Governor Rutherford B. Hayes of Ohio, a reformer. The Democrats nominated Governor Samuel J. Tilden of New York. Voting irregularities in three Southern states caused the election that year to remain undecided for several months. Grant told Congress to settle the matter through legislation, without blaming either party. Grant mobilized troops in Louisiana and South Carolina, who kept the peace. Grant assured both sides that he would not use the army to force a result, except to curb violence, and agreed that Congress should form an Electoral Commission to decide the matter. The result was the Compromise of 1877: the Electoral Commission ruled that the disputed votes belonged to Hayes, but the last troops were withdrawn from Southern capitals. The Republicans had won, but Reconstruction was over. Grant appointed four Justices to the Supreme Court of the United States. In 1869, after Robert C. Grier retired from the bench and Congress's restoration of a ninth seat on the court, Grant filled the first two vacancies. Grant first appointed former Secretary of War Edwin M. Stanton and Attorney General Ebenezer R. Hoar. Neither man would take his seat: Stanton was confirmed, but died before he took office; Hoar was widely disliked in the Senate, which defeated his nomination 24–33. Following a cabinet discussion, Grant submitted two more names to the Senate: William Strong and Joseph P. Bradley. Strong was a former justice of the Supreme Court of Pennsylvania who retired to take up a private practice in Philadelphia. Bradley, a New Jersey lawyer, also had a successful private practice. Both men were railroad lawyers, and their appointment led to accusations that Grant intended them to overturn Hepburn v. Griswold, decided on the same day Grant sent their nominations to the Senate. That case, which was unpopular with business interests, held that the federal debt incurred before 1862 be paid in gold, not greenbacks. Nonetheless, the Senate confirmed both Strong and Bradley and the following year the Supreme Court reversed the Hepburn case. Grant appointed Justice Ward Hunt to the Supreme Court, where he voted to uphold Reconstruction laws. The Civil Service reform initiative had limited success, as Grant's cabinet implemented a merit system that increased qualified candidates and relied less on Congressional patronage. Secretary of Interior Columbus Delano, however, exempted the Interior Department from competitive examinations, and Congress refused to enact permanent Civil Service reform. Delano resigned under pressure from the press, having allowed a spoils system of land and patent frauds and ignored Interior department officials' award of surveying contracts to his son, who got paid without doing any of the contracted work. Grant appointed Zachariah Chandler, who succeeded Delano and cleaned up corruption in the Interior Department. Grant appointed reformers Edwards Pierrepont and Marshall Jewell as Attorney General and Postmaster General, respectively, who supported Bristow's investigations. In 1875, Pierrepont cleaned up corruption among the U.S. Marshals and U.S. Attorneys in the South. Grant suggested other reforms as well, including a proposal that states should offer free public schooling to all children, although he also endorsed the Blaine Amendment, which would have forbidden government aid to schools that have any religious affiliation. In 1874, on becoming Treasury Secretary, Benjamin H. Bristow began a series of reforms. Finding that millions of dollars in revenue were missing, Bristow discovered what became known as the Whiskey Ring—tax officials taking bribes in exchange for not taxing distillers. Having obtained Grant's first endorsement, "Let no guilty man escape," Bristow moved quickly in 1875 to raid and shut down corrupt distilleries, collapsing the Ring. Bristow obtained 238 indictments, leading to 110 convictions, and restored millions of tax dollars to the Treasury. When Bristow's investigation implicated Babcock as part of the Whiskey Ring, Grant became defensive, believing Babcock was the innocent victim of a witch hunt. While denying immunity to minor Whiskey Ring conspirators in the Midwest, Grant worked to protect Babcock. In 1876, Babcock was found not guilty at a trial in which Grant testified on his behalf through a deposition. After the trial, under public pressure, Grant dismissed Babcock from the White House. 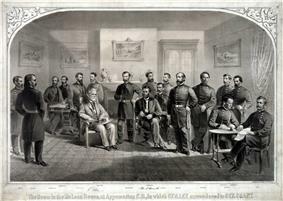 Grant later pardoned several of the convicted Whiskey Ring members. During Grant's second term in office, a congressional investigation exposed corruption in the Treasury Department in the Sanborn incident, where Secretary Richardson hired John D. Sanborn (a friend of Congressman Benjamin Butler, the former Civil War general) as an independent tax collector on a percentage basis, also known as a moiety. Treasury officials were then privately instructed not to press for payment, so that accounts would become delinquent and Sanborn would get paid more when he "discovered" them. The Congressional investigation committee report condemned Secretary Richardson for permitting the aggressive tax collection system implemented by Sanborn but did not formally make any impeachment charges. To prevent future unscrupulous actions, Grant signed the Anti-Moiety Act into law in 1874, abolishing that payment system. Grant served as president during the Gilded Age, a time when the economy was open to speculation and western expansion that fueled corruption in government offices. Against the harsh public revelation of the railroad bribery scandal, Grant also faced charges of misconduct in nearly all federal departments, especially in the Treasury and Interior departments, engaging his administration in constant conflict between corrupt associates and reformers. Although personally honest with his own money matters, Grant had difficulty in spotting corruption in others. He was protective of associates, whose persecutions he saw as unjust. Grant's military discipline produced a loyalty that shielded associates from attack at the cost of his own reputation, unless evidence of personal misconduct was overwhelming. No person linked any of the scandals together, except possibly Grant's personal secretary, Orville E. Babcock, who indirectly controlled many cabinet departments and delayed investigations. In his first term, in addition to the Gold Ring, Grant had to respond to Congressional investigations into the Collectors Ring at the New York Custom House. After the Panic, Congress debated an inflationary policy to stimulate the economy and passed what became known as the Inflation Bill on April 14, 1874. Many farmers and workingmen favored the bill, which would add $64 million in greenbacks to circulation, but some Eastern bankers opposed it because it would weaken the dollar. Grant unexpectedly vetoed the bill on the grounds that it would destroy the credit of the nation. Grant's veto placed him securely in the conservative faction of the Republican party, and was the beginning of the party's commitment to a strong gold-backed dollar. Grant later pressured Congress for a bill to further strengthen the dollar by gradually reducing the number of greenbacks in circulation. After losing the House to the Democrats in the 1874 elections, the lame-duck Republican Congress did so. On January 14, 1875, Grant signed the Specie Payment Resumption Act into law. The Resumption Act required gradual reduction of the number of greenbacks allowed to circulate and declared that specie payment resumption would begin in 1879. Grant appointed Richardson, himself involved in a scandal, to the Court of Claims and appointed Benjamin H. Bristow of Kentucky as his replacement. Bristow also supported Grant's anti-inflationary, hard money policy. 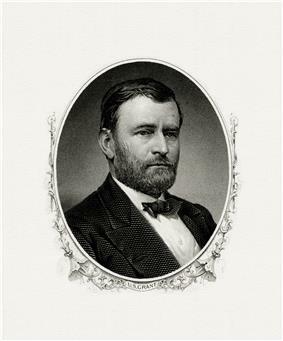 BEP engraved portrait of Grant as President. Grant's second term saw renewed economic turmoil. In September 1873, Jay Cooke & Company, a New York brokerage house collapsed after failing to fully sell bonds issued by Cooke's railroad, the Northern Pacific Railway. The collapse sent ripples through Wall Street, and other banks and brokerages that owned railroad stocks and bonds were also ruined. On September 20, the New York Stock Exchange suspended trading for ten days. Grant, who knew little about finance, traveled to New York to consult leading businessmen and bankers for advice on how to curb the panic, which became known as the Panic of 1873. Grant believed that, as with the collapse of the Gold Ring in 1869, the panic was merely an economic fluctuation that affected bankers and brokers. He responded cautiously, instructing Treasury Secretary William Adams Richardson to buy $10 million in government bonds, thus injecting cash into the system. These purchases curbed the panic on Wall Street, but a five-year industrial depression, later called the Long Depression, nonetheless swept the nation. Many of the nation's railroads—89 out of 364—went bankrupt. Grant continued to work for a strong dollar. In February 1873, Grant signed into law the Coinage Act of 1873, which effectively ended the legal basis for bimetallism (that is the use of both silver and gold as money), and established the gold standard in practice. The Coinage Act discontinued the standard silver dollar and established the gold dollar as the monetary standard. Critics who wanted more money in circulation to raise prices later denounced the move as the "Crime of 1873" claiming the law caused deflation and helped bankers while hurting farmers. 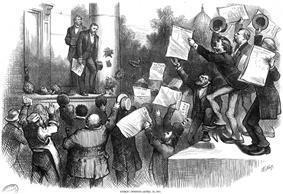 Grant congratulated for vetoing the "inflation bill" on April 22, 1874. Hamilton Fish, shown behind Grant, supported the veto. Many of such men bolted in 1872, calling themselves the Liberal Republican Party. Led by Charles Francis Adams of Massachusetts and Senator Carl Schurz of Missouri, they publicly denounced the political patronage system that Sumner called "Grantism" and demanded amnesty for Confederate soldiers. The Liberal Republicans nominated Horace Greeley, another Republican who had come to dislike Grant and his policies. The rest of the Republican Party nominated Grant for reelection, with Senator Henry Wilson of Massachusetts replacing scandal-ridden Colfax as vice-presidential nominee. The Democrats, seeking to benefit from anti-Grant sentiment, nominated Greeley as well. The fusion effort was unsuccessful, and Grant was easily reelected. The Liberal Republicans were unable to deliver many votes, and Greeley was only successful in areas the Democrats would have carried without him. A strong economy, debt reduction, lowered tariffs, repeal of the income tax, and civil service reforms helped Grant defeat the Liberal Republicans. Grant won 56% of the poplar vote and an Electoral College landslide of 286 to 66. These actions had a large impact on the nation's small gold market, and gold speculators tried to make a profit by anticipating how much gold Boutwell would sell in a given week. Abel Corbin, Grant's brother-in-law, sought to use his connection with the president to gain inside information for himself and his associates, Jay Gould, a Wall Street trader and railroad magnate, and his partner Jim Fisk. This group of collaborators was later called the "Gold Ring." Corbin convinced Grant to appoint Daniel Butterfield as assistant Treasurer, and Gould soon made Butterfield his informant. Meanwhile, Gould and Fisk quietly stockpiled gold. Gould convinced Corbin that a high gold price would be good for the nation's prosperity, and Corbin passed this theory on to Grant. The conspirators believed they had convinced the president, and continued to stockpile gold, hoping to sell into a rising market. After consulting with Alexander Stewart (his erstwhile nominee for Treasury Secretary) in early September, Grant stopped the sale of gold, believing a higher gold price would help Western farmers. By mid-September, however, Grant became suspicious of Corbin, particularly when Corbin tried to drive a wedge between Grant and Boutwell. The gold price continued to rise as the conspirators bought ever more. The rising price began to affect the wider economy, and Grant, seeing that the increase was unnatural, told Boutwell to sell gold, thereby reducing its price. Boutwell did so the next day, on September 22, 1869, later known as Black Friday. The sale of gold from the Treasury defeated Gould's corner on the market as the gold price plummeted, relieving the growing economic tension. Gould and Fisk managed to escape without much harm to themselves. A New York bank collapsed, and trading dried up for months; a general recession did not follow, however, and the economy resumed its post-war recovery. Soon after taking office, Grant took steps to return the nation's currency to a more secure footing. During the Civil War, Congress had authorized the Treasury to issue banknotes that, unlike the rest of the currency, were not backed by gold or silver. The "
Grant and Fish were more successful in their satisfaction of the Alabama claims, a dispute between Great Britain and the United States. The dispute stemmed from the damage done to American shipping during the Civil War by the five warships and commerce raiders built for the Confederacy in British shipyards including, most famously, the CSS Alabama. The Americans claimed that Britain had violated neutrality by recognition of Confederate belligerency. When the war ended, the United States demanded retribution, which the British refused to pay. Negotiations continued fitfully, a sticking point being the claims of "indirect damages" as opposed to the discussion to the harm directly caused by the five ships. Sumner opposed the third-party negotiated Johnson-Clarendon Convention settlement, that was rejected by the Senate, believing that England should directly pay $2 billion in gold or, alternatively, cede Canada to the United States. Fish convinced Grant that peaceful relations with Britain were more important than acquisition of more territory, and the two nations agreed to negotiate along those lines. A commission in Washington produced a treaty whereby an international tribunal would settle the damage amounts; the British admitted regret, but not fault. The Senate approved the Treaty of Washington, which also settled disputes over fishing rights and maritime boundaries, by a 50–12 vote in 1871. Grant believed in peaceful expansion of the nation's borders, and thought acquisition of the majority-black island nation would allow new economic opportunities for African Americans in the United States; while increasing American naval power in the Caribbean. Secretary of State Hamilton Fish dismissed the idea, seeing the island as politically unstable and troublesome. Senator Charles Sumner of Massachusetts opposed annexation because it would decrease the number of autonomous nations run by Africans in the western hemisphere. He and other senators also objected for another reason—they did not wish to add more blacks to the overall American population. Grant personally lobbied Senators to pass the treaty, going so far as to visit Sumner at his home. Fish added to the effort out of loyalty to the administration, but to no avail; the Senate refused to pass the treaty. Sumner's role in leading the opposition led to political enmity between him and Grant. After the Dominican initiative failed, Grant convinced Fish to stay in the Cabinet and gave him greater authority to run the State Department. Even before Grant became president, expansionists in American politics desired control over Caribbean islands. William H. Seward, Secretary of State under Lincoln, attempted to buy the Danish West Indies from Denmark. Seward began negotiations to purchase the two former European colonies on the island of Hispaniola with the eastern two-thirds, Spanish-speaking Dominican Republic and the French-speaking, western one-third, Haiti; however the early anti-imperialist Republicans in Congress rejected the plan. Grant renewed negotiations to annex the Dominican Republic, led by Orville E. Babcock, a wartime confidant of Grant's. Grant was initially skeptical, but at the urging of the Admiral Porter, who wanted a naval base at Samaná Bay, and Joseph W. Fabens, a New England businessman employed by the Dominican government, Grant examined the matter and became convinced of its wisdom. Grant sent Babcock to consult with Buenaventura Báez, the pro-annexation Dominican president, to see if the proposal was practical; Babcock returned with a draft Treaty of Annexation in December 1869. During the William W. Belknap. Grant ordered Custer arrested for breach of military protocol and barred him from leading an upcoming campaign against the Sioux. Grant later relented and let Custer fight under Brigadier General Alfred Terry. Sioux warriors led by Crazy Horse killed Custer at the Battle of the Little Big Horn, the most famous defeat for the U.S. Army in the Indian wars. Two months later, Grant castigated Custer in the press, saying "I regard Custer's massacre as a sacrifice of troops, brought on by Custer himself, that was wholly unnecessary – wholly unnecessary." Custer's death shocked the nation, while Grant's Peace Policy yielded to militarism; Congress appropriated funds for 2,500 more troops, the Army constructed two more Western forts and took over the Indian agencies, barring Indians from purchasing rifles and ammunition. Grant's Peace Policy showed some success in reducing conflict with fewer battles between Indians and whites on the western frontier, but the increased slaughter of the buffalo, encouraged by Grant's subordinates, caused renewed conflict with the Apache in 1872, convincing their leader, Cochise, to move the tribe to a new reservation, and ending a war started the year before. In Oregon, relations were less peaceful, however, as war with the Modocs erupted in April 1873. The Modocs refused to move to a reservation and killed the local army commander, Major General Edward Canby. Although Grant was upset over Canby's death, he ordered restraint, disregarding Sherman's advice to seek revenge or exterminate the tribe. The Army, led by Sherman, captured, tried, and executed the four Modoc warriors responsible for Canby's murder in October 1873. Grant ordered the rest of the Modoc tribe relocated to the Indian Territory. Grant's attempts to live peacefully with Native Americans marked a radical reversal of what had long been the government's policy of Indian removal since the 1830s. He appointed Ely S. Parker, a Seneca Indian and member of Grant's wartime staff, as Commissioner of Indian Affairs. "My efforts in the future will be directed," Grant said in his second inaugural address, "by a humane course, to bring the aborigines of the country under the benign influences of education and civilization ... Wars of extermination ... are demoralizing and wicked." Grant's "Peace Policy" (also called the "Quaker Policy") aimed to replace entrepreneurs serving as Indian agents with missionaries. In 1869, Grant signed a law establishing a Board of Indian Commissioners to oversee spending and reduce corruption in the Bureau of Indian Affairs. Two years later, in 1871, Grant signed a bill ending the Indian treaty system; the law now treated individual Native Americans as wards of the federal government, and no longer dealt with the tribes as sovereign entities. Grant wished for Indian tribes to be protected on reservations and educated in European-style farming and culture, abandoning their hunter-gatherer way of life. Considered liberal-minded at the time, although unpopular today, the policy would see fulfillment years later in the Dawes Act of 1887. 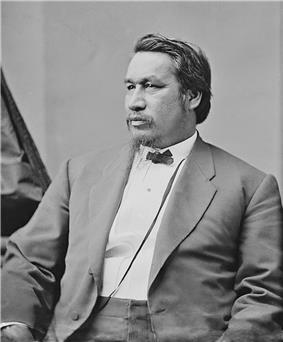 Ely S. Parker, appointed by Grant, was the first Native American to serve as Commissioner of Indian Affairs. That same year, Grant signed the Amnesty Act, which restored political rights to former Confederates. After the collapse of the Klan in 1872, conservative whites formed armed groups such as the Red Shirts in South Carolina and the White League. Unlike the Ku Klux Klan, they were not secret. They used violence and intimidation to take control of state governments away from Republicans. The Panic of 1873 and the ensuing depression contributed to public fatigue, and the North grew less concerned with reconstructing the South. Grant began to favor a more limited use of troops, lest they create the impression that he was acting as a military dictator; he was also concerned that increased military pressure in the South might cause conservative whites in the North to bolt the Republican Party. In 1874, Grant was able by proclamation to peaceably end the Brooks-Baxter War in Arkansas. 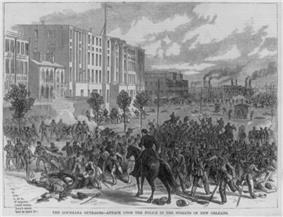 However, the same year, in Louisiana Grant sent troops and three warships to New Orleans to stop violence, that included the Colfax Massacre, over the disputed election of Governor William Pitt Kellogg two years earlier. By 1875, Democratic "Redeemer" politicians retook control of all but three Southern states. As violence against black Southerners escalated once more, Edwards Pierrepont (Grant's fourth attorney general) told Governor Adelbert Ames of Mississippi that the people were "tired of the autumnal outbreaks in the South," and declined to directly intervene. Instead, Pierrepont sent an emissary to negotiate a peaceful election. Grant signed an ambitious Civil Rights Act of 1875, which expanded federal law enforcement by prohibiting discrimination on account of race in public lodging, public transportation, and jury service. The law was rarely enforced, however, and it did not stop the rise of white supremacist forces in the South. In the election of 1876, the remaining three Republican governments in the South fell to Redeemers, and the ensuing Compromise of 1877 marked the end of Reconstruction. Grant selected several non-politicians to his cabinet, including Jacob D. Cox (Interior), John Creswell (Postmaster General), and Ebenezer Rockwood Hoar (Attorney General)—were well-received and uncontroversial. That summer, at the invitation of wealthy backers, Grant and his family vacationed for the first time in what became known as the "summer capital" and "the resort of presidents", Long Branch, New Jersey. To ensure his family's privacy, Grant barred the general public from entering the White House grounds. Grant's presidency began with a break from tradition, as Johnson declined to ride in Grant's carriage or attend the inauguration at the Capitol. In his inaugural address, Grant advocated the passage of the Fifteenth Amendment and said he would approach Reconstruction "calmly, without prejudice, hate or sectional pride." Grant took an unorthodox approach to his cabinet choices, declining to consult with the Senate and keeping his choices secret until he submitted them for confirmation. In his effort to create national harmony, Grant purposely avoided choosing Republican Party leaders. Out of personal loyalty, Grant appointed his friends Elihu B. Washburne to the State Department and John A. Rawlins as Secretary of War. Washburne served only twelve days before resigning over claims of ill-health; the plan having been designed to give him greater diplomatic clout when Grant appointed him Minister to France. 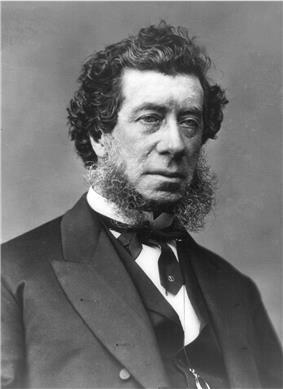 Grant then appointed Hamilton Fish, a conservative New York statesman, as Secretary of State. Grant promoted Sherman to his own former post as Commanding General. Rawlins, however, issued orders that reduced Sherman's authority; after Grant refused to overturn Rawlins's orders, his relationship with Sherman became strained. Rawlins died in office a few months later, and Grant appointed William W. Belknap as his replacement. Belknap and Congress continued to restrict Sherman's military authority. The Democrats nominated former New York Governor Horatio Seymour. Their campaign focused mainly on ending Reconstruction and returning control of the South to the white planter class, which alienated many War Democrats in the North. The Democrats attacked Reconstruction and the Republican Party's support of African-American rights, while deriding Grant, calling him captain of the "Black Marines". Grant won the election by 300,000 votes out of 5,716,082 votes cast, receiving an electoral college landslide, of 214 votes to Seymour's 80. Elected to public office for the first time, Grant at the age of forty-six was the youngest nineteenth century presidential candidate to take office. Both Democrats and Republicans believed Grant's election was a triumph of conservative principles that included sound money, efficient government, and the restoration of Southern reconstructed states. Grant was the first president elected after the nation had outlawed slavery and granted citizenship to former slaves. Implementation of these new rights was slow to come; in the 1868 election, the black vote counted in only sixteen of the thirty-seven states, nearly all in the South. Grant entered the 1868 campaign season with increased popularity among the Radical Republicans following his abandonment of Johnson. The Republicans chose Grant as their presidential candidate on the first ballot at the 1868 Republican National Convention in Chicago, where he faced no significant opposition. In his letter of acceptance to the party, Grant concluded with "Let us have peace," which became his campaign slogan. For vice president, the delegates nominated House Speaker Schuyler Colfax. Grant's General Order No. 11 and antisemitism became an issue during the presidential campaign. Grant sought to distance himself from the order, saying "I have no prejudice against sect or race, but want each individual to be judged by his own merit." As was common at the time, Grant remained at his home in Galena during the campaign, and left most of the active campaigning and speaking on his behalf to his campaign manager William E. Chandler and others. 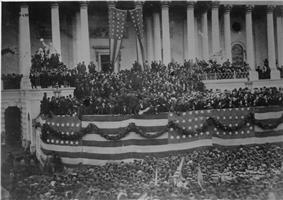 First inauguration of Ulysses S. Grant on the steps of the Capitol on March 4, 1869. When the Senate reinstated Stanton, Johnson told Grant to refuse to surrender the office and let the courts resolve the matter. Grant told Johnson in private that violating the Tenure of Office Act was a federal offense, which could result in a fine or imprisonment. Believing he had no other legal alternatives, Grant returned the office to Stanton. 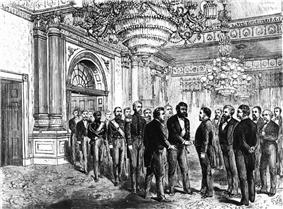 This incurred Johnson's wrath; during a cabinet meeting immediately afterwards, Johnson accused Grant of breaking his promise to remain Secretary of War. Grant disputed that he had ever made such a promise although cabinet members later testified he had done so. On January 14, 1868, newspapers friendly to Johnson published a series of articles to discredit Grant over returning the War Department to Stanton, stating that Grant had been deceptive in the matter. This public humiliation infuriated Grant, and he defended himself in a written response to Johnson. When Grant's response became public, it increased his popularity among Radical Republicans and he emerged from the controversy unscathed. Although Grant favored Johnson's impeachment, he took no active role in the impeachment proceedings against Johnson which, in part, centered on Johnson's removal of Stanton. Johnson barely survived, and none of the other Republican leaders directly involved benefited politically in their unsuccessful attempt to remove the president. President Johnson wished to replace Secretary of War Stanton, a Lincoln appointee who sympathized with Congressional Reconstruction. To keep Grant under control as a potential political rival, Johnson asked him to take the post. Grant recommended against the move, in light of the Tenure of Office Act, which required Senate approval for cabinet removals. Johnson believed the Act did not apply to officers appointed by the previous president, and he subsequently forced the issue by making Grant an interim appointee during a Senate recess. Grant relented and agreed to accept the post temporarily, lest he be rendered politically irrelevant. Stanton, believing he had Senate protection, vacated the office until the Senate reconvened. Conflict between Radicals and Conservatives continued after the 1866 elections. Rejecting Johnson's vision for quick reconciliation with former Confederates, Congress passed the Reconstruction Acts, which divided the southern states into five military districts to protect the freedmen's constitutional and congressional rights. Military district governors were to lead transitional state governments in each district. Grant, who was to select the general to govern each district from a group designated by Johnson, preferred Congress's plan for enforcement of Reconstruction. Grant was optimistic that Reconstruction Acts would help pacify the South. By complying with the Acts and instructing his subordinates to do likewise, Grant further alienated Johnson. When Sheridan removed public officials in Louisiana who impeded Reconstruction, Johnson was displeased and sought Sheridan's removal. Grant recommended a rebuke, but not a dismissal. Throughout the Reconstruction period, Grant and the military protected the rights of more than 1,500 African-Americans elected to political office and overturned the first black codes in 1867. Johnson argued for a moderate approach to Reconstruction, but the Radical Republican-controlled Congress opposed the idea and refused to admit Congressmen from the former Confederate states. Over Johnson's vetoes, Congress renewed the Freedmen's Bureau and passed the Civil Rights Act of 1866. During the congressional election campaign later that year, Johnson took his case to the people in his "Swing Around the Circle" speaking tour. Johnson pressured Grant, by then the most popular man in the country, to go on the tour; Grant, wishing to appear loyal, agreed. Johnson advocated an immediate return of the former Confederate states into the Union without any guarantee of African-American citizenship, and castigated Radical Republican leaders, including Charles Sumner and Thaddeus Stevens. Grant believed that Johnson was purposefully agitating conservative opinion to defy Congressional Reconstruction. Finding himself increasingly at odds with Johnson, Grant confided to his wife that he thought Johnson's speeches were a "national disgrace". Publicly, Grant attempted to appear loyal to Johnson while not alienating Republican legislators essential to his future political career. Grant, believing that Johnson was about to attempt to unilaterally seat Southern Congressmen, ordered that Southern military arsenals be depleted and have the arms shipped to the North, to prevent their capture by Southern state governments. In November 1865, President Johnson sent Grant on a fact-finding mission to the South. Afterwards, Grant filed a report recommending continuation of a reformed Freedmen's Bureau, which Johnson opposed, but advising against the use of black troops in garrisons, which he believed encouraged an alternative to farm labor. Grant did not believe the people of the devastated South were ready for civilian self-rule, and that both whites and blacks in the South required protection by the federal government. He also warned of threats by disaffected poor people, black and white, and recommended that local decision-making be entrusted only to "thinking men of the South" (i.e., men of property). In this respect, Grant's opinion on Reconstruction aligned with Johnson's policy of pardoning established southern leaders and restoring them to their positions of power. He joined Johnson in arguing that Congress should allow representatives from the South to take their seats. 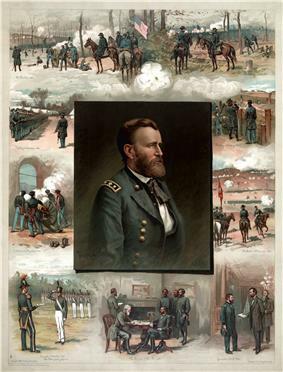 On July 25, 1866, Congress promoted Grant to the newly created rank of General of the Army of the United States. Later in April, Sherman, without consulting Washington, concluded an armistice agreement with Confederate general, Joseph Johnston. The agreement allowed the existing Confederate state government in North Carolina to remain in power; additionally Sherman affirmed citizens' property rights that included keeping their slaves. Sherman believed the agreement was consistent with Lincoln's recent statements to him at City Point. Stanton and Grant quickly surmised the terms were much too lenient. Stanton even declared so publicly with scorn for Sherman; Grant, concerned that his lead commander's mistake not be mishandled, requested a cabinet meeting to discuss the problem. Grant personally conveyed the rebuke to Sherman and ultimately gained his consent to renegotiate the agreement in accord with the terms set at Appomattox. On April 14, five days after Grant's victory at Appomattox, Lincoln was fatally shot by John Wilkes Booth at Ford's Theater and died the next morning. The assassination was part of a conspiracy that targeted a number of government leaders. Grant attended a cabinet meeting that day, and Lincoln had invited Grant and his wife to the theater, but they declined as they had plans to travel to Philadelphia. Many, including Grant himself, thought that Grant had been a target in the plot. Secretary of War Stanton notified Grant of the President's death and summoned him to Washington. The following day, Grant hastily ordered the arrest of paroled Confederate officers. Major General Edward Ord's army intelligence sources were able to narrow the existing threats in Washington and persuade Grant to reverse his arrest orders. Attending Lincoln's funeral on April 19, Grant stood alone and wept openly. He said of Lincoln, "He was incontestably the greatest man I have ever known." Regarding the new President, Andrew Johnson, Grant told Julia that he dreaded the change in administrations; he judged Johnson's attitude toward white southerners as one that would "make them unwilling citizens", and initially thought that with President Johnson, "Reconstruction has been set back no telling how far." In March 1865, while Lincoln met at City Point with Grant, Sherman, and Porter, Union forces finally took Petersburg. They captured Richmond that April. Lee's troops began deserting in large numbers; disease and lack of supplies also diminished the remaining Confederate armies. Lee attempted to link up with the remnants of Joseph E. Johnston's defeated army, but Union cavalry forces led by Sheridan were able to stop the two armies from converging. Lee and his army surrendered to Grant at Appomattox Court House on April 9, 1865. Grant gave generous terms; Confederate troops surrendered their weapons and allowed to return to their homes with their mounts, on the condition that they would not take up arms against the United States. Within a few weeks, the Civil War was over. Once Sherman reached the East Coast and Thomas dispatched Hood in Tennessee, Union victory appeared certain, and Lincoln attempted to negotiate an end to the war with the Confederates. He enlisted Francis Preston Blair to carry a message to Confederate President Jefferson Davis. Davis and Lincoln each appointed commissioners, but the conference soon stalled. Grant contacted Lincoln, who agreed to personally meet with the commissioners at Fort Monroe. The peace conference that took place near Union-controlled Fort Monroe was ultimately fruitless, but represented Grant's first foray into diplomacy. Robert E. Lee surrendered to Grant at McLean House in the village of Appomattox Court House. Grant, his forces reduced in number after sending troops north to fend off Early's attack, approved of a plan to blow up part of the enemy trenches from an underground tunnel. The explosion created a crater from which Confederates could easily pick off Union troops below. The 3500 Union casualties outnumbered the Confederates' by three-to-one; although the plan could have been successful if implemented correctly, Grant admitted the tactic had been a "stupendous failure." On August 9, 1864, Grant, who had just arrived at his headquarters in City Point, narrowly escaped death when Confederate spies blew up an ammunition barge moored below the city's bluffs. Rather than fight Lee on a full frontal attack as he had done at Cold Harbor, Grant continued to extend Lee's defenses south and west of Petersburg, to capture vital railroad links. As Grant continued to push the Union advance westward, Lee's lines became overstretched and undermanned. After the Federal army rebuilt the City Point Railroad, Grant was able to use mortars to attack Lee's entrenchments. After crossing the James River undetected, Grant and the Army of the Potomac advanced southward to capture Petersburg. Confederate General P.G.T. Beauregard was able to defend the city, and Lee's veteran reinforcements soon arrived. The result was a long nine-month siege of Petersburg, stalling the advance. Northern resentment grew as the war dragged on, but an indirect benefit of the Petersburg siege was that Lee was unable to reinforce armies opposing Sherman and Sheridan. During the siege, Sherman took Atlanta, a victory that advanced President Lincoln's reelection. Sheridan was assigned command of the Union Army of the Shenandoah and Grant directed him to "follow the enemy to their death". Lee had sent General Jubal Early up the Shenandoah Valley to attack the federal capital and draw troops away from the Army of the Potomac, but Sheridan defeated Early, ensuring that Washington would not be endangered. Grant then ordered Sheridan's cavalry to destroy vital Confederate supplies in the Shenandoah Valley. When Sheridan reported suffering attacks by irregular Confederate cavalry under John S. Mosby, Grant recommended rounding up their families for imprisonment as hostages at Fort McHenry. Sigel's and Butler's efforts sputtered, and Grant was left alone to fight Lee in a series of bloody battles known as the Overland Campaign. Grant crossed the Rapidan River on May 4, 1864, and attacked Lee in the Battle of the Wilderness, a hard-fought three-day battle with many casualties. Rather than retreat as his predecessors had done, Grant flanked Lee's army to the southeast and attempted to wedge the Union Army between Lee and Richmond at Spotsylvania. Lee's army got to Spotsylvania first, and a costly battle ensued, lasting thirteen days. 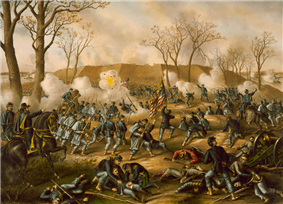 During the battle, Grant attempted to break through Lee's line of defense, resulting in one of the bloodiest assaults during the Civil War, known as the Battle of the Bloody Angle. Unable to break Lee's defenses after repeated attempts, Grant flanked the Confederate army to the southeast again at North Anna, a battle that lasted three days. This time the Confederate Army had a defensive advantage on Grant. Grant then maneuvered the Union Army to Cold Harbor, a vital railroad hub that linked to Richmond, but Lee's men were again able to entrench against the Union assault. During the third day of the thirteen-day battle, Grant led a costly assault on Lee's trenches. As casualty reports became known in the North, heavy criticism fell on Grant, who was castigated "the Butcher" by the Northern press after taking 52,788 casualties in thirty days since crossing the Rapidan. Lee's army suffered 32,907 casualties, and he was less able to replace them. The costly assault at Cold Harbor was the second of two battles in the war that Grant later said he regretted. Unknown to Lee, Grant pulled out of Cold Harbor and moved his army south of the James River, freed Butler from the Bermuda Hundred (where the rebels had surrounded his army) and attacked Petersburg, Richmond's central railroad hub. Lincoln commissioned Grant a major general in the Regular Army and assigned him command of the newly formed Georgia, the heartland of the Confederacy, to Union invasion. 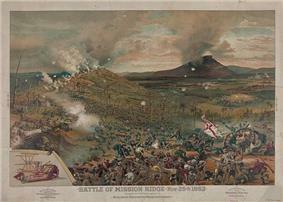 Union troops swarm Missionary Ridge and defeat Bragg's army. 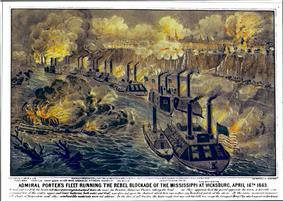 The fall of Vicksburg gave the Union Army control over the Mississippi River and split the Confederacy in two. Although the success at Vicksburg was a great morale boost for the Union war effort, Grant received criticism for his decisions and his reported drunkenness. The personal rivalry between McClernand and Grant continued after Vicksburg, until Grant removed McClernand from command when he contravened Grant by publishing a military order without permission. When Stanton suggested Grant be brought back east to run the Army of the Potomac, Grant refused, writing to Washington that he knew the geography and resources of the West better and he did not want to upset the chain of command in the East. Halleck ordered McClernand to Memphis, Grant's new headquarters. Lincoln, convinced by Halleck, told McClernand that he was to be satisfied with leading an army division under Grant's authority. In December 1862, Grant moved to take Vicksburg by an overland route, with a joint water expedition on the Mississippi led by Sherman. Confederate cavalry raiders stalled the advance by capturing his Union supply depot, while the Confederate army led by Lieutenant General John C. Pemberton concentrated and repulsed Sherman's direct approach to Vicksburg at Chickasaw Bayou. McClernand's attempt to advance was equally unsuccessful. Grant then made a series water movements and diggings attempting to bypass Vicksburg guns; however, these proved to be unsuccessful. On April 16, 1863, in a bold gamble, Grant successfully ran Admiral David Porter's Union gunboats south under direct fire of the Confederate Vicksburg batteries to meet up with his Union troops who he marched south down the west side of the Mississippi River. Grant ordered diversionary battles, confusing Pemberton and allowing Grant's army to cross east over the Mississippi landing Union troops at Bruinsburg. Continuing east he captured Jackson, the state capital and a railroad supply center. At the Battle of Champion Hill, Pemberton's army was defeated,  and forced to retreat into Vicksburg. After Grant assaulted the Vicksburg entrenchments twice, suffering severe losses, he settled in for a siege lasting seven weeks. As the siege began, Grant lapsed into a two-day drinking episode for which he was later criticized. With Grant's forces maintaining the siege, Pemberton surrendered Vicksburg to him on July 4, 1863. The Battle of Jackson, fought on May 14, 1863, was part of the Vicksburg Campaign. Located on the high bluffs of the Mississippi River, Vicksburg was the key to Union victory in the West; both Lincoln and Grant were determined to take the central Confederate stronghold. Lincoln authorized Major General John A. McClernand to raise an army in his home state of Illinois for the purpose. Grant was aggravated to learn by newspaper rumors of Lincoln's appointment of McClernand believing one commander was best for the campaign. In November 1862 Grant did support Lincoln's preliminary Emancipation Proclamation, by giving specific orders to incorporate contraband African American slaves into the Union war effort, giving them clothes, shelter, and paid wages for their services. Besides the Vicksburg campaign, Grant was in charge of the cotton trade in his military district. 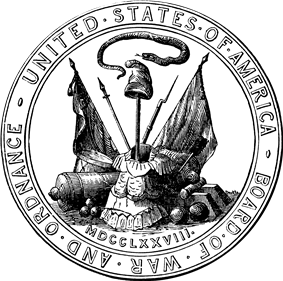 On December 17, 1862 Grant issued General Order No. 11, expelling Jews, as a class, from Grant's military district, believing Jewish merchants were profiteering from an illicit cotton exchange through enemy lines while Union soldiers died in the fields. 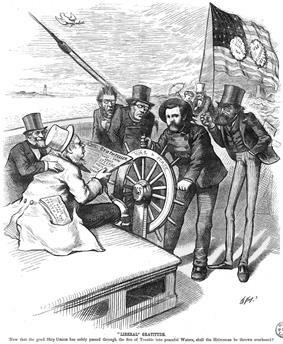 After the Jewish community and Northern press criticized Grant over his military order Lincoln demanded the order be revoked  Grant rescinded the order, having lasted twenty-one days, while the controversy subsided. Grant's biographer, Jean Edward Smith, wrote that Grant's order was "one of the most blatant examples of state-sponsored anti-Semitism in American history." Grant's bold gamble; Porter's gunboats running the Vicksburg Confederate gauntlet. Encamped on the western bank of the Tennessee River, Grant's army, known as the Army of the Tennessee, had grown to 48,894 troops. Grant met with Brigadier General William T. Sherman, and the two readied their troops to attack the Confederate army of roughly equal strength at Corinth, Mississippi. The Confederates, led by Generals Albert Sidney Johnston and P.G.T. Beauregard, struck first on April 6, 1862, attacking the five divisions of Grant's army bivouacked nine miles south at Pittsburg Landing near Shiloh . Grant's troops challenged the Confederate onslaught, but were unable to halt it. At day's end, the Confederates captured one Union division while the remaining Union army was vulnerable and might have been destroyed. The Confederates, however, stopped fighting due to exhaustion and having lacked reinforcements to continue the battle. At dawn, Grant counterattacked, adding 20,000 fresh troops from Major General Don Carlos Buell and Lew Wallace's divisions. The Confederates were forced to retreat back to Corinth. Grant was criticized for failing to entrench and for high casualties on the first day of battle; as a result, Halleck removed Grant from active command of his army. The battle was the costliest in American history to date, with total casualties of 23,746, but Lincoln dismissed Grant's critics, saying "I can't spare this man; he fights." 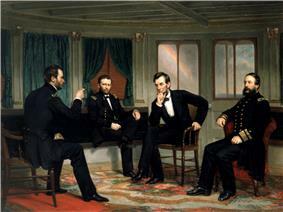 Discouraged and disappointed, Grant considered resigning his commission, but Sherman convinced him to stay. Seven weeks later, Halleck's forces took Corinth and Grant was reinstated as field commander of the Army of the Tennessee. 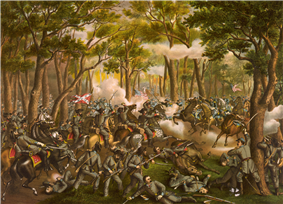 On September 19, 1862 Grant's Union forces defeated Confederates at the Battle of Iuka and on October 4, successfully defended Corinth; inflicting heavy casualties on the Confederate Army. Before the attack on Fort Sumter, Grant had not reacted strongly to Southern secession. The news of the attack came as a shock in Galena, and Grant shared his neighbors' mounting concern about the onset of war. After hearing a speech by his father's attorney, John Aaron Rawlins, Grant found renewed energy and belief in the Union cause. Rawlins later became Grant's aide-de-camp and close friend during the war. Grant recalled with satisfaction that after that first recruitment meeting in Galena, "I never went into our leather store again." Grant was not politically active nor did he publicly endorse any candidate before the Civil War. His father-in-law was a prominent Missouri Democrat, which hurt Grant's bid to become county engineer in 1859, while his father was an outspoken Republican in Galena. In the 1856 election, Grant cast his first presidential vote for the Democrat, James Buchanan, later saying he was really voting against John C. Frémont, the first Republican candidate. In 1860, he favored the Democratic presidential candidate Stephen A. Douglas over Abraham Lincoln, and Lincoln over the Southern Democrat, John C. Breckinridge. Lacking the residency requirements in Illinois at the time, he could not vote. By August 1863, after the fall of Vicksburg during the Civil War, Grant's political sympathies fully coincided with the Radical Republicans' aggressive prosecution of the war and emancipation of the slaves. At age 32, with no civilian vocation, Grant struggled through seven financially lean years. His father initially offered Grant a place in the Galena, Illinois, branch of the tannery business, on condition that Julia and the children stay with her parents in Missouri or with the Grants in Kentucky. Ulysses and Julia opposed another separation and declined the offer. In 1854, he farmed on his brother-in-law's property near St. Louis, using slaves owned by Julia's father; the farm failed. Two years later, he and his family moved to land on his father-in-law's farm, and built a family home he called "Hardscrabble". Julia hated the rustic house, which she described as an "unattractive cabin". During this time, he acquired a slave from Julia's father, a thirty-five-year-old man named William Jones. Having met with no success farming, the Grants left the farm when their fourth and last child was born in 1858. Grant freed his slave in 1859 instead of selling him, at a time when slaves commanded a high price and Grant needed money badly. For the next year, the family took a small house in St. Louis where he worked with Julia's cousin Harry Boggs as a bill collector, again without success. In 1860, Jesse offered him the tannery job in Galena without conditions, and Grant accepted. The leather shop, "Grant & Perkins", sold harnesses, saddles, and other leather goods, and purchased hides from farmers in the prosperous Galena area. Grant and family moved to a rental house that year.